I am planning to buy a used V2 hub (off from Ebay) to upgrade the existing V1 I have. Is it now possible to integrate V1 hub as a repeater/extender for V2 hub. Can they be chained together. While buying a used Hub, what information do I need to seek from seller. If it is factory reset can I be able to add it to my account. Would I need any other information like setup code or do I need to email support to prove that I am the new owner now and add it to my account. Thanks for your replies and guidance. Two hubs will not act as repeaters. Most wired devices (switches, plugs, etc.) do just fine as repeaters. Not sure on what to ask regarding a used hub. New ones are relatively cheap, so it would need to be a great deal to me. Personally, when you can easily find a new v2 hub for less than $60 US, the trouble of dealing with a used hub in an unknown state is not a fun concept. Davin is correct that hubs (with one exception - the one in the Samsung mesh wifi device) will not participate/repeat. Do the wifi mesh hubs repeat zigbee and zwave or just wifi? Thanks for the replies and clarifications. In this case I believe I can still use my old V1 Hub and pair some devices to it in a zone less covered and isolated from coverage of V2 Hub, and add both to my location. Does it usually gives any troubles having more than one hub added to a single location. Point noted for considering buying a new hub in ongoing deals instead of a used one. I will keep an eye. However in case I end up getting one, I guess i can still prove ownership physically (via pics) to get the new welcome code. There was a firmware update a few months after the initial release, and now the subhubs do repeat zigbee and zwave. But you don’t get any extra benefit just because they’re in the same plastic box as the Wi-Fi router: it’s exactly the same range as if you put any other Z wave or zigbee device in that physical location. It used to be 1 hub per location. There’s some movement toward changing that but I believe it requires NewApp and a v.3 hub - @JDRoberts - I think you had some info about that? @DavinD was specifically asking about the “Samsung Wi-Fi“ mesh system, which has a primary hub and then subhubs. They are typically sold as a set of three. So if you have the Wi-Fi mesh system, you are expected to have more than one hub and they are all part of the same network. If you have any of the other hub models, they don’t work together but you can view them through the new app and switch from one to the other in the app without having to sign out in between. Thanks for info. 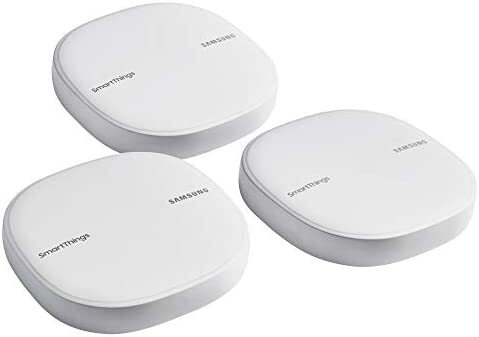 So if I plan to stay with one hub per for my somewhat small home only, what are some suggestions for ZWave/Zigbee repeaters only to cover dry zones, cause I may not have AC powered plugged in devices at distant spots to act as auto repeaters. Pretty much any mains powered Z wave device will act as a Z wave repeater except for some smoke detectors. And the same thing for mains power zigbee devices to act as a zigbee repeater. That includes light switches, in wall outlets, in wall micros, plug in pocket sockets, plug in sensors, even zwave light bulbs for zwave or IKEA Tradfri Light bulbs for zigbee. So you’ll have lots of choices. As of this writing, the least expensive zigbee repeater in either the US or the UK appears to be the new IKEA Tradfri pocketsocket. You can’t beat the price of $10, and while we can’t know long-term reliability yet because it’s new, it appears to have decent engineering. It’s just a little big, so you can’t stack two of them in one outlet. A lot of the initial bad reviews are because people were expecting it to work with apple’s HomeKit, like the rest of the tradfri line, and it doesn’t yet. But it does seem to work fine with smartthings and, like the bulb, is one of the few zigbee repeaters that seems to work well with the Xaomi sensors. So if you just need a simple on/off device, it’s certainly worth considering. So I was able to order a single [ET-WV525KWEGUS: ] SmartThings wifi mesh router and range extender, to be able to nail two targets in one shot. I assume it would work as a range extender - hooked or linked to my primary smartthings V2 hub - for zigbee and zwave device connectivity in dead spots. It would work as a mesh extender (or similar to a Wifi access point) , wired or linked to my primary Wifi Router Asus RT AC68U (Advanced Tomato Firmware 1.28.0000 -3.5-140). The intention is to “extend” my same SSID wifi network using SmartThings mesh Wifi and “not” to create a new additional Wifi SSID of its own. All other functionality like DHCP, Access Rules, DNS,Gateway and so on would still be used as existing from my main WiFi router. Based on your similar experiences, can you please confirm my understanding and possibility for above two points and if there is any deviation or workaround I need to consider to make this extender work as intended. The smartthings Wi-Fi hubs can only be used with a similar model line. They don’t work with the hubs from other model lines. That’s what the “They are separate networks.” means in my post that you quoted. That’s also why the same post says As for other model hubs, yes, with the new app you can now have more than one per location, but you can’t combine them into one automation and they don’t repeat for each other. Zigbee and Z wave repeaters can only repeat for devices on the same network. So you can have the two hubs that you mentioned on the same account, but they can’t see each other, they won’t repeat for each other, and they cannot control the other’s devices. Being on the same account just means that you can switch from looking at one network with one hub to looking at the other network with the other hub under the same smartthings ID. It doesn’t make them work together in any way. I don’t know about the Wi-Fi aspects that you mentioned, but I don’t think that will work either. As mentioned, that model uses plume technology to enable its Wi-Fi Meshing. It’s not going to just automatically mesh with any Wi-Fi router. This is true of most Wi-Fi mesh. You can’t buy an Eero sub hub and add it to a ubiquity network, for example. If you want to have more than one smart things hub that will repeat for each other, you have to be using the Wi-Fi mesh models for each hub on the network, as that’s what it is designed for. None of the other models can work in this way. Thanks for the explanation .Much to my disappointment it is not in accordance with my presumptions. Was able to return the Smartthings WiFi Mesh Extender. Unable to see a common device which could act as repeater/extender for both Z-wave and Zigbee, except the Iris 3210-L smartplug. Will it do as intended , any real world performance opinions about it. Unable to see a common device which could act as repeater/extender for both Z-wave and Zigbee, except the Iris 3210-L smartplug. That is correct, at present I believe the Iris 3210 is the only end device that will repeat both zigbee and zwave. It has been very popular in the community for just that reason, with most people reporting that it works well.